I was born in Scotland in 1966. From a musical childhood I went on to spend five years at St Mary's music school in Edinburgh studying violin and viola. In 1983 I entered the Newark school of violin making. On completion of violin making school I went on to work for the next five years in some of the leading restoration workshops of Holland, France and Germany. This included three years in the workshops of Geigenbau Machold where I concentrated on the detailed restoration, sound adjustment and set-up of some of the finest examples of the classical Italian masters. In early 1992 I began working with Roger Hargrave in Germany. We Spent the next four years building accurate copies of the classical Italian masters that have since gained a worldwide reputation for their quality in both sound and style. During this time I was closely involved with in-depth research into classical violin construction including detailed analysis of the work of Giuseppe Guarneri. This led to the 1994 exhibition "Violin Masterpieces of Guarneri del Gesù" held at the Metropolitan museum in New York, and the subsequent publication of "Giuseppe Guarneri del Gesù" in 1998. This book has gone on to be recognised as one of the most important studies of the life and working methods of Giuseppe Guarneri. 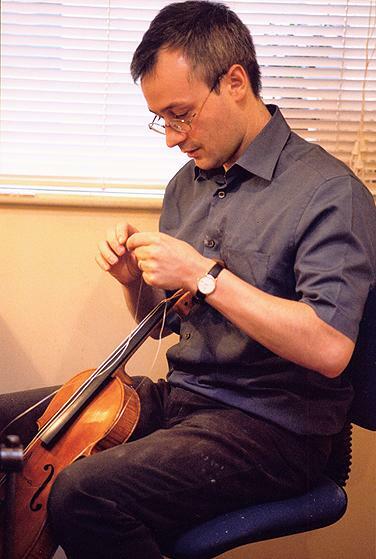 In 1997 I opened my own workshop in Cambridge to concentrate on building new instruments, and in 2009 moved to Edinburgh where I continue to build both precise copies and free interpretations of the great classical masters. Although most instruments are spoken for, they can be tried prior to collection by appointment. I also aim to have a small selection of work in stock which will be available for sale. To commission an instrument normally no deposit will be required, and if after the trial period you are not entirely satisfied there is no obligation to buy. Please contact me for details on the present waiting time for commissions and the availability of instruments to try.